Today I received a new case for my iPad. The reason for getting the case is that I dropped my iPad on saturday afternoon and while I didn't break it i did put a small dent into the side of the device. So i went online and started looking for a case, not a cover as I don't think that the covers give any protection to the device. This is the case I bought and it is amazing the way that having a keyboard with an iPad changes how you write stuff on it. It seems very relaxing way to type. The keyboard is rubber keys but they react like a normal keyboard with no missed keys while typing. 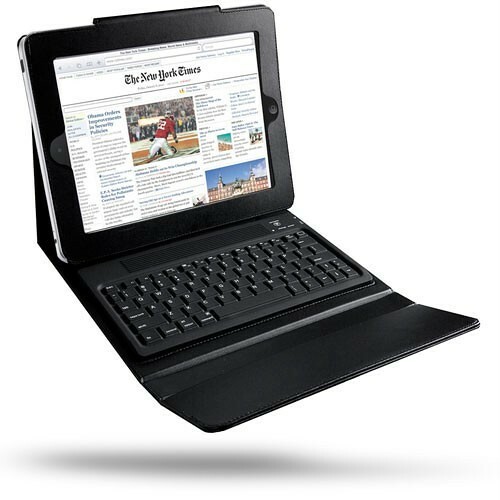 I do like the angle of the iPad while typing and it is adjustable as well but the best bit is the price. so how much for a keyboard and case for an iPad2 would £100 be a reasonable price? Well the first cover I looked at was £50 on overstock.com and i went right through the purchase order until the last part where they told me i had to install Flash. I don't even have flash installed on my home computer. So I started looking again thinking that I would end up paying approx £100 for it. While searching i found an entry for the above device on eBay for £20 plus £5 postage, so now thinking that I was going to have to bid on a case I nearly didn't open the link. I was therefore very pleasantly surprised. When the auction was buy now for £20. There of course is the issue that you always have with a new keyboard where the keys aren't where you have trained your fingers to look for them. Though I do believe that given time this will not be an issue. So my current rating for this device is 4 out of 5 stars.